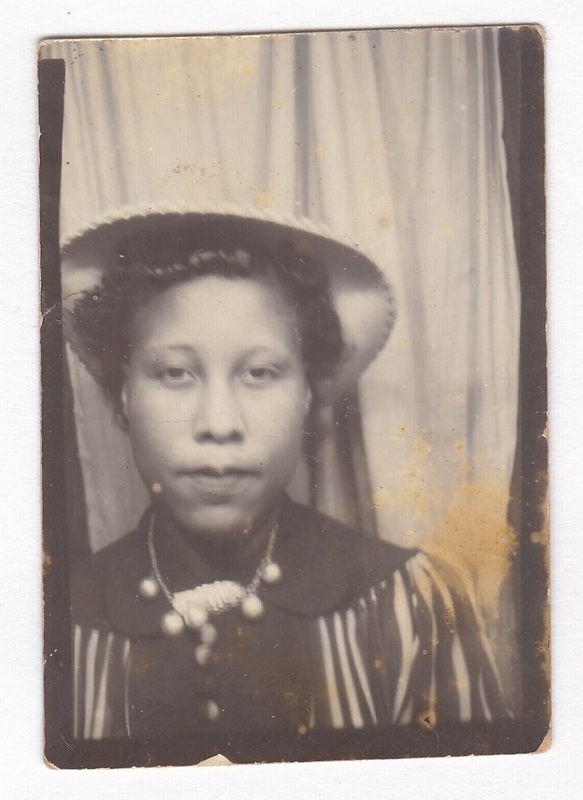 Photo (presumably from a strip of photos from a photo booth) measuring 1.5 x 2 inches. I’ve heard photography described as the art of taking things out of context, and there’s something about the photo booth setting that, to me, emphasizes that dislocation. This woman could be in a photo booth anywhere. Was she with anyone, or completely alone? After all, this photo didn’t even require the presence of a photographer. Why did she decide to get her picture taken just then? The ease with which a photo booth is used means she could have been commemorating anything from an important occasion to the purchase of a new hat, assuming she needed a reason at all. And if this is one cut from a strip of several photos, what did the others look like? Was this the reject? Or maybe her favorite? We don’t even have the benefit of the others for context. But even so, we can still enjoy looking at what we have here. Maybe she gave the others to friends. I’m intrigued that she’s wearing a brooch and a necklace. Yep, she seems to like her bling. If she’s like me, she stuck the brooch on the coat the last time she wore it, and then forgot it was there when she put on the necklace. I love what you wrote about this photo. I wouldn’t have thought of those questions, but now I want to know the answers, too. So many possibilities, the longer you ponder it.